Expecting students to enjoy learning in one way is like expecting everyone to like artichokes. There’s nothing wrong with liking artichokes, just as there is nothing wrong with wanting to learn in solitude…and there’s nothing wrong with hating artichokes or wanting to learn socially. Any educator understands the importance of accommodating children’s diverse ways of learning and discovering understanding. This is perhaps of supreme importance when it comes to early childhood education when the foundations of learning are being established. After two weeks of exploring our solar system, we felt it was time to explore our own planet. We started from the two ends of our planet, as they were the easiest to identify on a globe. The children learned that the top is the Arctic and the bottom is the Antarctic (which, literally means “not the Arctic”). The top is represented by polar bears and the bottom by penguins. 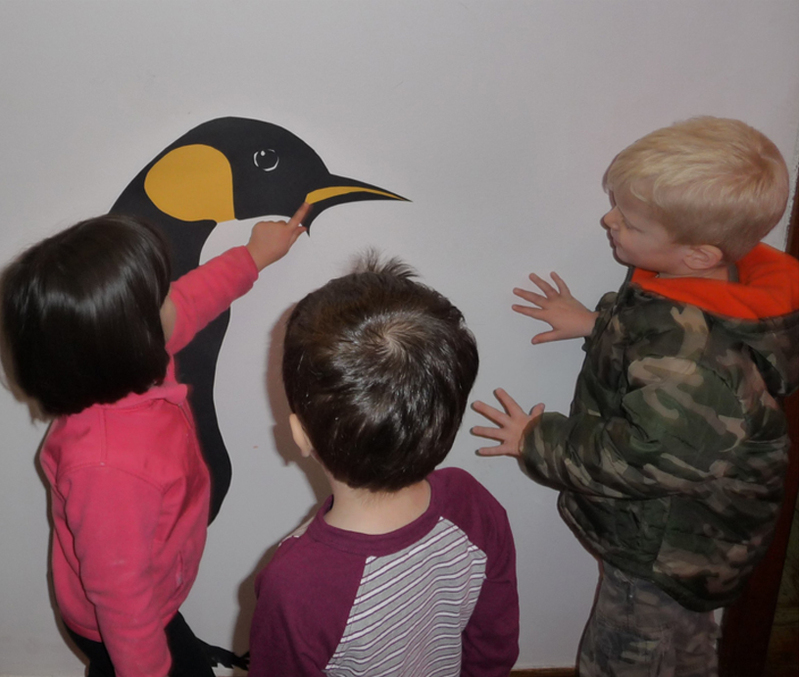 When the children learned that penguins only live in Antarctica and that the polar bears only live in the Arctic circle, the children proposed that perhaps this is because the polar bears might eat the penguins if they inhabited the same region. Our initial exploration of the earth consisted of this basic survey of the earth: the names of both poles of the planet with a representative animal for each. While approaching this topic, Mr. David wanted to allow the children to manipulate a variety of media on one theme. 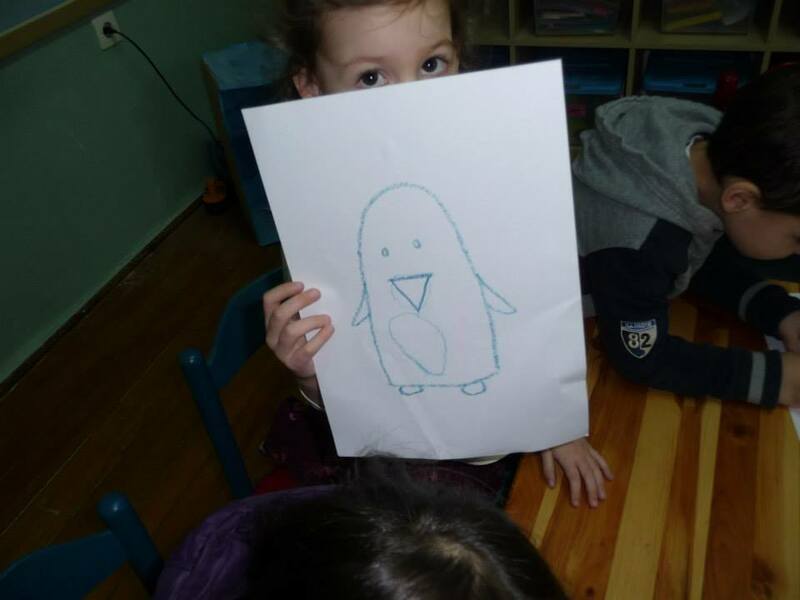 It’s no mystery that different children respond differently to different media: while there is nothing wrong with coloring a picture of a penguin, some children just won’t be engaged. Some may be more responsive if they are given opportunity to create puppets and narrate a story about them. So from this point on, he went all out penguin with the children: penguin portraits, penguin stick-puppets, penguin 3D sculptures, etc. 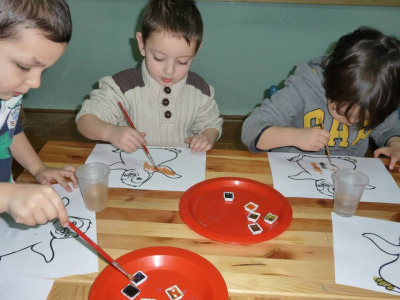 Here the children are using watercolor to paint dancing penguin coloring pages. The beginnings of a penguin portrait. 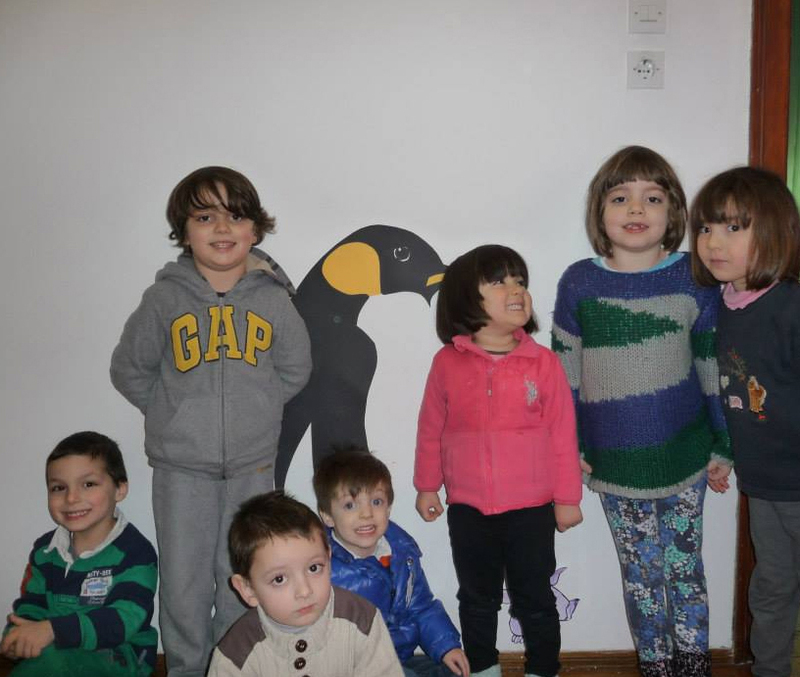 To help the children get a sense of the life-size scale of these Antarctic birds, Mr. David made a full-size Emperor Penguin. Turns out, the average height of an adult Emperor Penguin is about 120 cm, which is about the average height of a 4-year old human child. 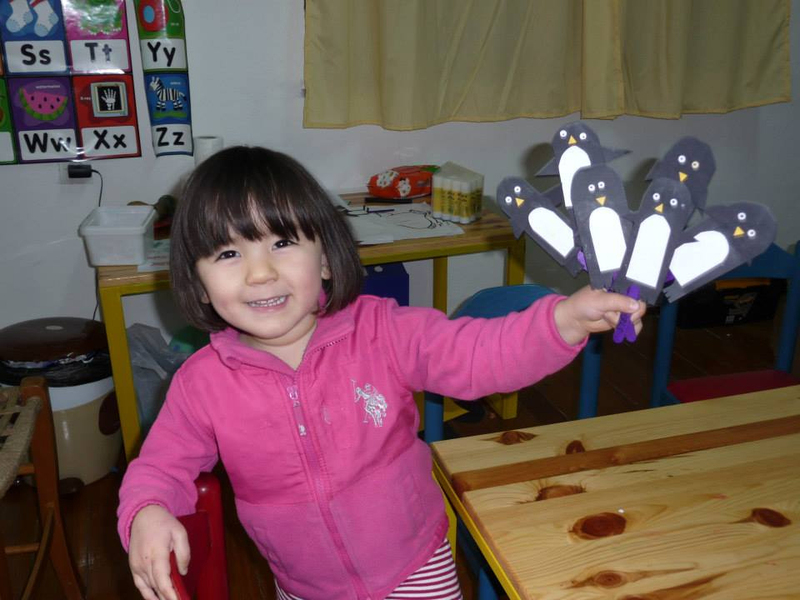 When the children created the penguin stick puppets, Mr. David wanted them to personalize the penguins in an effort to demystify these animals. 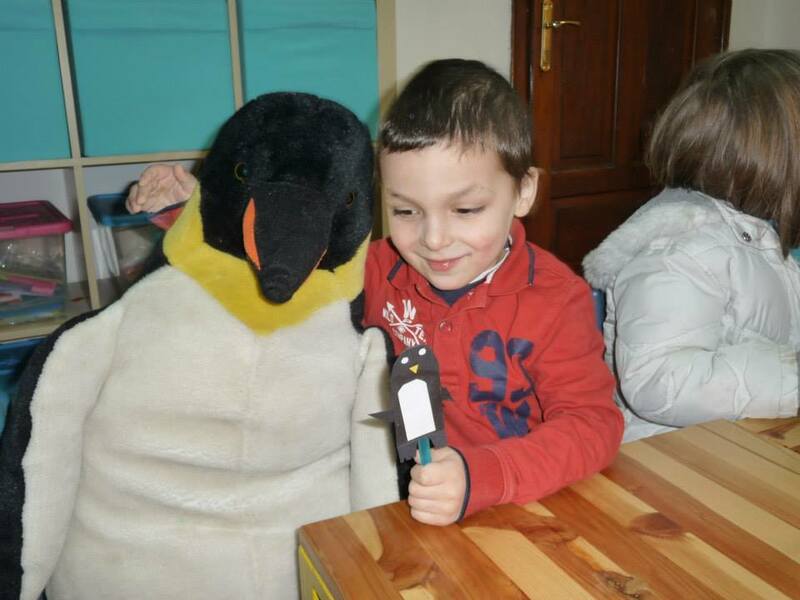 So the children named each of their penguin puppets and gave them personalities. When asked what their penguins like to eat, most of them said ice cream. Of course, this is a projection of their own preferences on this inanimate object but it was a fun way to get to understand the children. One child is having his penguin puppet converse with Bob’s cousin “Ed”. 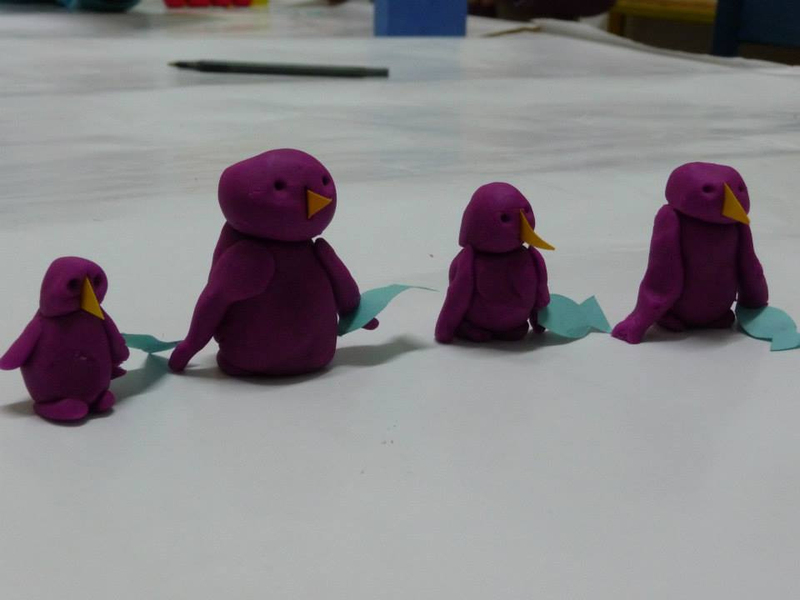 A family of penguin puppets. 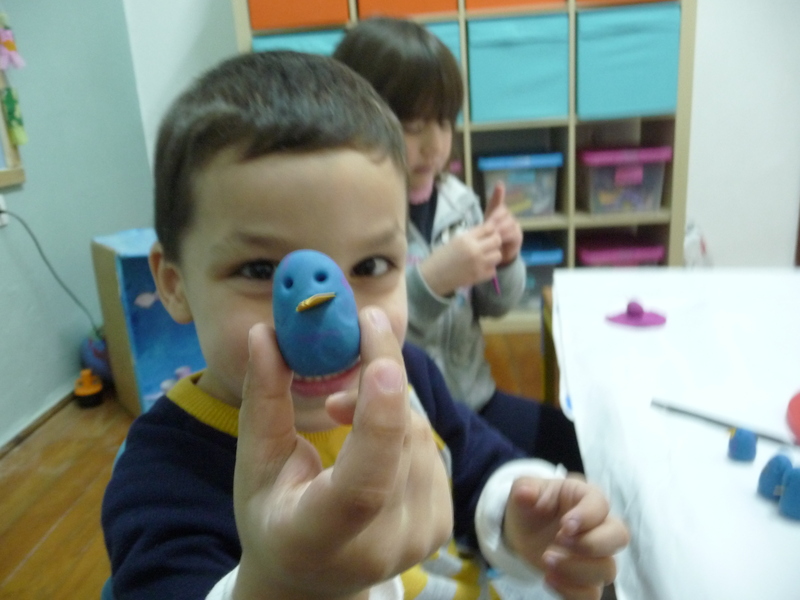 Then Mr. David moved them onward to sculpt 3D models using playdough. For some it was a simple egg shape with two poked eye holes and a yellow cardstock beak; for others, they wanted to add flippers. Still others expressed a concern that “their penguins will go hungry” so we had to cut out little blue fishes to feed our penguin friends. 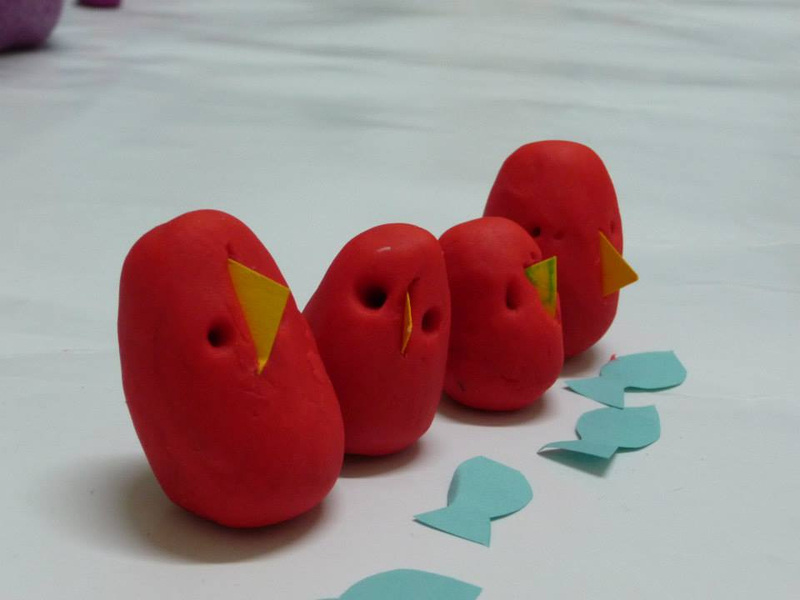 Without prompting, the children began to line up the penguins in single file, all facing the same direction. The older children began to make up stories and narrate to the whole group. 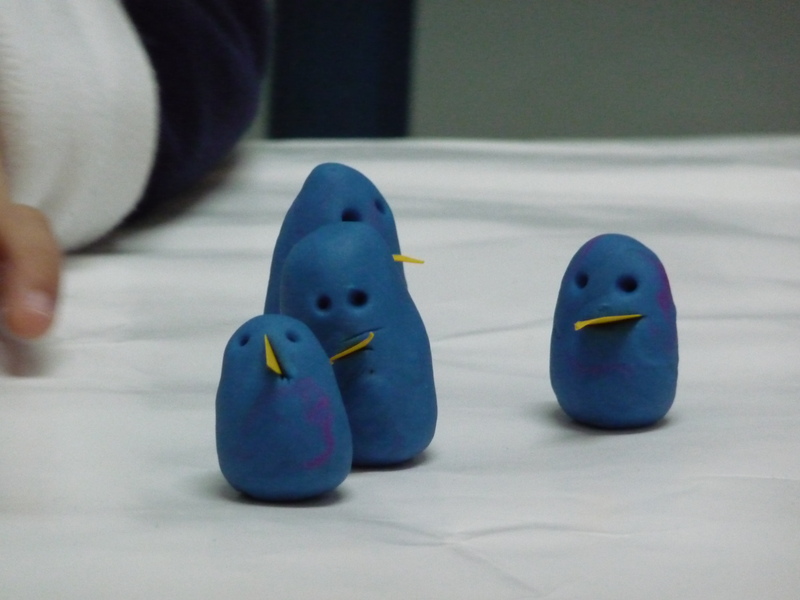 Most of the youngers ones were not yet developmentally ready to articulate a narration to the whole group so they just began to play with the penguins and talked to their partners about what their penguin was doing. 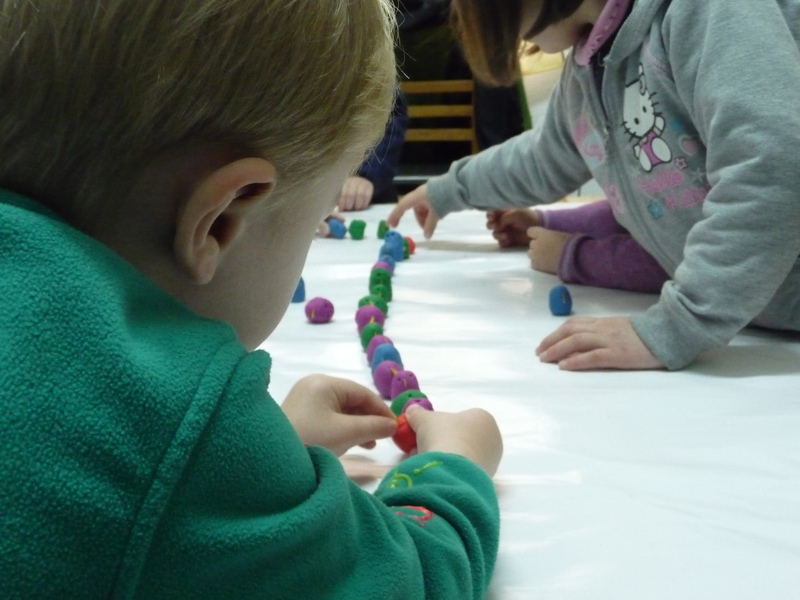 What was beautiful about this project was not only that the children were able to go away with a newfound interest in a topic that perhaps they didn’t really care for before nor even that the children went away understanding that there are different ways to explore a topic. It is that student choice and voice so naturally and intuitively played out throughout the entire endeavor. 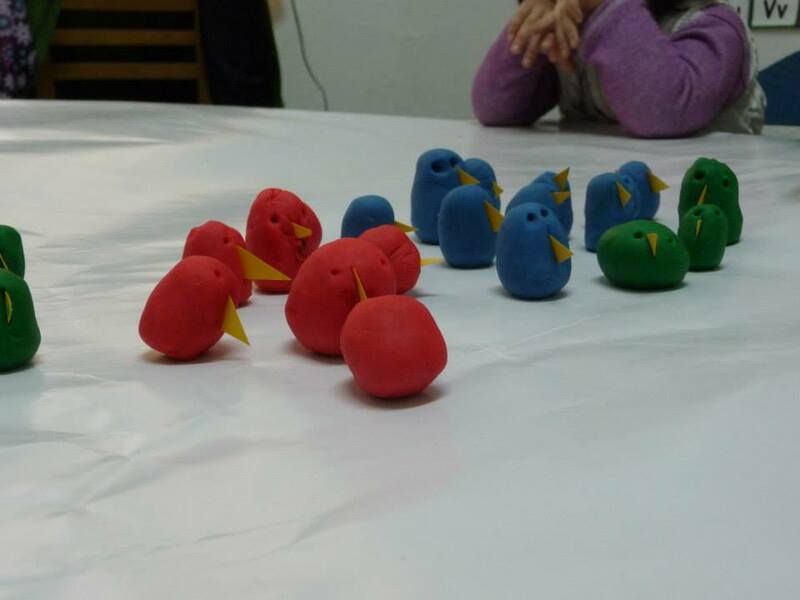 The project turned out to be very much student-directed and the teacher’s role became more that of a facilitator who helped guide the children’s interests and ideas for the project. Even though Mr. David mainly wanted the children to be engaged in the task at hand and develop an enjoyment for learning, what he essentially ended up doing was providing them opportunities to determine the direction of the project by listening to and catering to their needs, no matter how trivial it seemed. This entry was posted in PROJECTS and tagged differentiation, diverse ways of learning, early childhood, early childhood education, ECE, Gardner, I make my own options, march of the penguins, multiple intelligence, penguins, playdough, playdough sculptures, preK, preschool, puppets, stick puppets, student-centered, student-directed by Carol Song. Bookmark the permalink.